The Warren & Brown HY series category 6A STP modular jacks have been specifically designed to simplify and accelerate network deployment. These fully shielded modular jacks include a number of features which allow them to be easily installed in modular patch panels, wall outlets and floor distributors such as easy visual inspection of the wiring colour code to ensure every connection is correct. These shielded jacks can be terminated with standard IDC termination tools or the Warren & Brown HY series terminating tool, and the universal keystone format allows for multiple mounting options. Meeting or exceeding ISO/IEC 11801 Ed.2.2 system performance for Class EA networks (10 G, 500 MHz), the HY series CAT6A shielded jacks are suitable for PoE and PoE+ applications and their secure metal contact provides earthing integrity at the patch panel. 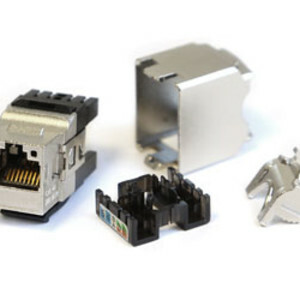 To ensure network deployment is simplified, these jacks are equipped with multidirectional cable entry to allow for straight or angled cable installation, and the optimised printed circuit design enables improved high frequency crosstalk performance. 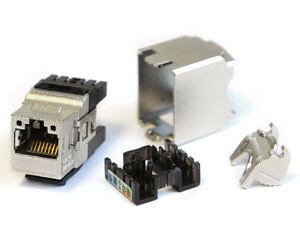 I am interested in Warren & Brown HY series CAT6A STP shielded modular jacks .